"Mobile First" Formatting is a feature unique to Mail-List.com. Some list owners love it, and some list owners hate it. You can turn it on or off as you wish. "Mobile First" Formatting will reduce the bad formatting, fragments from replies, noise and bulkiness of email, so that just the important words show up on your subscriber's screen. 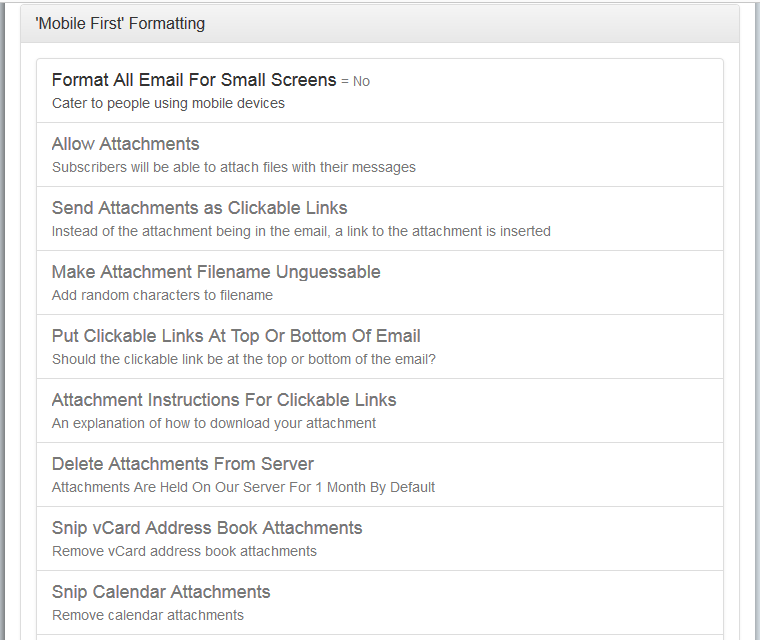 In addition, it allows you to use the "Clickable Attachments" feature. This turns ordinary attachments into a link inside the email, so that subscribers can choose whether they want that attachment or not. Or choose to ignore it on their smartphone, but download it when they are on their desktop. The larger your list, the more young people on your list, or the more activity on the list, the more that you would want this feature turned on. On the other hand, if you are sending out event announcements, job postings, want to see your logo on the emails, or your members like to reply in red ink, you probably want this feature turned off. 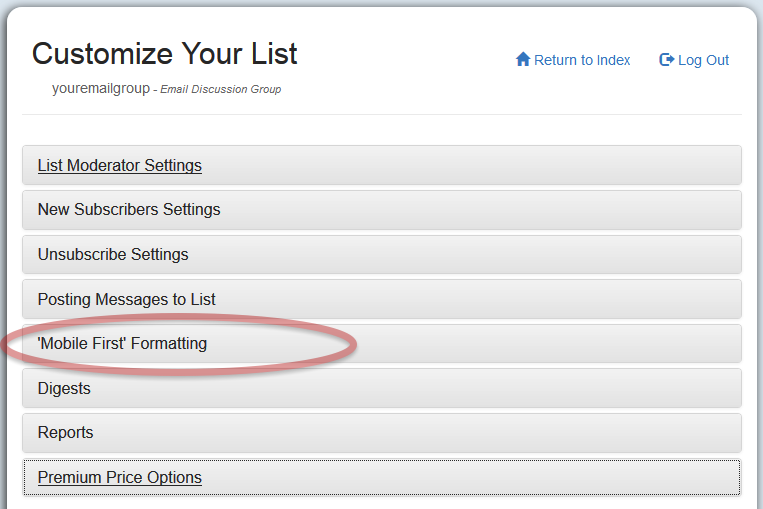 You can access the setting by logging in and clicking on the Customize Your List button. When a new list is set up, this option is off by default. There are many options that are dependent upon Format All Email For Small Screens being turned on. These features start with converting all incoming email to plain text, eliminating colors, graphics, background images, logos in signatures, etc. This allows the email to fit in the width of the small screen, no matter the size. And you just scroll down to read the entire message. Nobody likes to pinch and zoom, or scroll sideways to read an email. In fact, surveys show that the majority of people will delete an email, rather then battle the bad formatting. And since there is no standard for HTML email, and dozens and hundreds of ISP's and email readers out there, all sort of strange formats can be coming into your discussion group. Using Mobile First formatting will make sure all of your subscriber's messages are readable. 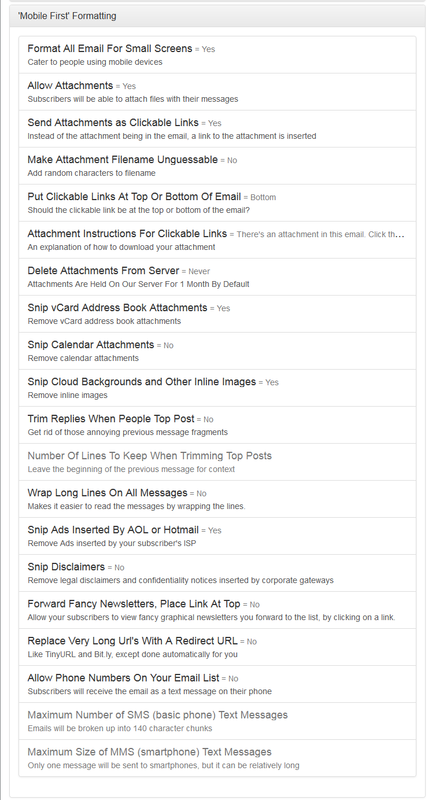 Clickable Attachments also makes the emails small and quick to load. Cellphone users are not wasting bandwidth on attachments they don't need or want. And the lack of the physical attachment in the email eliminates one of the biggest reasons why emails get blocked as spam or viruses. Mobile First formatting enables the use of the "Trim Replies When People Top Post" option. This option automatically eliminates all but the first few lines of those annoying previous message fragments that people with Outlook or Gmail replies send in. So your subscribers can concentrate on what that person said, and not be distracted by previous messages. The "Snip Disclaimers" option removes legal disclaimers and confidentiality notices inserted by corporate gateways. Nobody pays any attention to these long winded notices, and it does not make sense to claim confidentiality on a message to a mailing list anyway. If you want to stop Vcard address book attachments or calendar attachments from going to your list, there are options to accomplish that too. And if you don't want attachments to your list at all, not even Clickable Attachments, you must use "Mobile First" Formatting and turn the Allow Attachments option off (it's on by default). If you turn the "Mobile First" Formatting option off, our system will pass the email through to your list exactly as it was sent in. None of the options listed above will work.